This year, my wife and I have committed to sharpening up our prayer life. Our church just went through a series on power and necessity of prayer, and the current season in our lives has been impressing upon us our greater need to be personally and jointly devoted to prayer. We’ve been praying together in the mornings, but we both had been sensing a desire and weight to pray. Plus, Tim Keller just came out with a new book on prayer, aptly entitled Prayer: Experiencing Awe and Intimacy with God,, so I figured this could be a good reading project to help us out. “In the second half of my adult life, I discovered prayer. I had to. In the fall of 1999, I taught a Bible study course on the Psalms. It became clear to me that I was barely scratching the surface of what the Bible commanded and promised regarding prayer. Then came the dark weeks after 9/11, when our whole city sank into a kind of corporate clinical depression, even as it rallied. For my family the shadow was intensified as my wife Kathy struggled with the effects of Crohn’s disease. Finally, I was diagnosed with thyroid cancer. Imagine you were diagnosed with such a lethal condition that the doctor told you that you would die within hours unless you took a particular medicine–a pill every night before going to sleep. Imagine that you were told that you could never miss it or you would die. Would you forget? Would you not get around to it some nights? No–it would be so crucial that you wouldn’t forget, you would never miss. Well, if we don’t pray together to God, we’re not going to make it because of all we are facing. I’m certainly not. We have to pray, we can’t just let it slip our minds. Maybe it was the power of the illustration, maybe it was just the right moment, maybe it was the Spirit of God. Or, mostly likely of all, it was the Spirit of God using the moment and the clarity of the metaphor. For both of us, the penny dropped; we realized the seriousness of the issue, and we admitted that anything that was a truly no-nnegotiable necessity was something we could do. Reading that passage, the penny has ‘dropped’ for my wife and I as well, and we know that 2015 is going to be a year where we take prayer more seriously than we ever have before. Prayer is a matter of life or death; it is communication and communion with the Triune God who is the source of every breath in our lungs. What could be more important than that? I would invite you to consider placing it at the center of your priorities this year as well. There are any number of prayer programs or approaches that can help you. Here’s one simple way to pray you can take up easily. 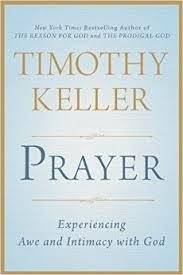 Also, I would encourage you to maybe take up Tim Keller’s book on prayer as well. Many of us don’t pray for various reasons. Some of us have theological reasons. We don’t understand what’s going on, or we have questions about God’s willingness to answer or how it all works. I’ve talked with enough students and friends to know that theology can actually be a significant roadblock for many. Others have practical questions. We simply don’t know how to begin, or what even the most basic prayer life would look like. We start to pray, but we just end up fumbling about, wondering if we’re doing it right, or if we’ve simply been talking to ourselves. Finally, some of us have been praying for a while, but we have hit stagnant stages in our walks. In that case, many of us need to be led down more complex paths because we’ve fallen into spiritual ruts. Or, we need to simply be reminded of the beauty and glory of what’s actually happening in prayer. Keller’s book is helpful in that he aims to tackle the various dimensions of the issue to prayer, whether theological, practical, or what-have-you. There’s something for everyone there, whether young or old in their walk with Christ. Either way, whether with Keller’s book or through some other prayer plan, I’d encourage you to take up prayer with a renewed vigor this year. It could be a matter of life and death. Gee whiz. If only I could do it, too. None of us prays as we ought. THIS…is exactly why Calvinism rubs me the wrong way. It’s definitely a challenge. Every year, my wife and I try make it a goal to pay together more often. We fail quite often. Thank you, Derek! God bless you!!! I’ve been nourished, challenged, and molded by praying the Daily Office with the Book of Common Prayer. It invites me to a certain disciplined, habitual engagement with the Scriptures (especially the Psalms) that challenges me to grow, and to live out 1 Thessalonians 5:16-18 and Romans 12:1. I do not engage with this discipline as often as I’d like to, but I’m always compelled to return to its invitation, and that has been a gift of the Spirit. Praying with others helps; a small group at my parish prays the Morning Office every Tuesday. My parents have begun attending. My relationship with them isn’t always smooth, but there’s something convicting about the regular act of our praying together. This last year was a time when that life or death “pill” found its way back to the center of my life. Your–and Keller’s–insistence upon the urgency of prayer could not be more right, Derek. Happy New Year! Thanks Derek. Chuck Colson put me on a book by Bill Hybels, “Too Busy Not to Pray” a few years back. It is a easy read, and soul stirring. What was strange to me was that as I read that book, agreeing all the way through, praying became all the more difficult. The enemy knows Christians can put his works in jeopardy when we pray consistently, and in faith. Focusing our lives on daily time with God normally causes him to pull out his bag of tricks, so keep him bound, walking in love. Okay Derek, so my wife and I have been doing this challenge for one month. (Mine was your first comment at the top.) I just wanted to return to the page (like one of those healed lepers) and say thanks for posting. We’ve missed a few days, but we aim for every day, and God has been very gracious so far. I never want to go back to my less-prayerful past.